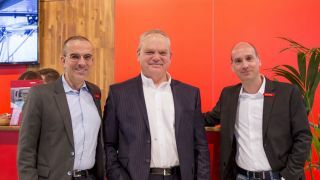 From left: Martin Berger, CSO of Riedel Communications; Matthias Bode, CEO of Archwave; and Thomas Riedel, founder and CEO of Riedel CommunicationsRiedel Communications is making continued investments in new technologies with its acquisition of Swiss audio networking and streaming specialist Archwave, and Cymatic Audio, an audio specialist within the music industry. These new partnerships will create a research and development (R&D) hub in Zurich, increase Riedel's global engineering team to more than 100 engineers, and expand its R&D capabilities for IP and standards such as AES67, which will further boost interoperability in the broadcast world. The latter acquisition will allow Riedel to enter new markets and get closer to musicians, many of whom already rely on Riedel technology in the background. "At Riedel, IP standards are vital not only for our intercom portfolio but also for all of the other Riedel product lines," said Thomas Riedel, founder and CEO of Riedel Communications. "By collaborating with Archwave, we are taking another important step toward providing complete networking solutions that allow broadcasters to work the way they want to work. With our new engineering team in Switzerland, we now have all the tools we need to create the plug-and-play workflows that our clients need for their transition to IP."